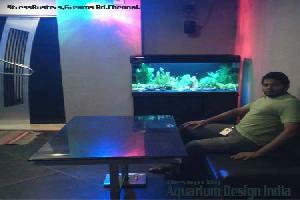 Aquarium substrate has various functions and should be chosen according to the type of tank, i.e. freshwater, planted, fish-only, reef, etc. In general, the substrate provides the fish with an orientation. Glass bottoms can irritate the fish, especially if the light is being reflected from the fixture on top of the tank. Next to “orientation” and a more natural look, the substrate is breeding and colonizing grounds for the beneficial bacteria and other microscopic life forms. 2-2.5 inches in height, or roughly 10 pounds of substrate for approximately 150 square inches of tank surface. Deeper layers especially with finer gravel sizes can pose a danger, given that food particles will sink into a less oxygenated area. This will over time produce hydrogen sulfite (rotten egg smell), which is highly toxic for the fish. Next to the general purposes of the substrate - a natural look and colonizing grounds - the substrate for marine and reef set-ups also provides an environment for crustaceans, crabs and other bottom dwelling creatures. The substrate should also be 2 – 2.5 inches in height. Another difference to other gravel options is that marine environments need more calcium and magnesium which will buffer the pH to higher levels. Next to the lighting, the substrate for planted aquariums is the most important factor in the successful growth of plants. The substrate for a planted tank should have the ability to store and provide nutrients for the plants. The majority of the nutrients should be in the gravel and not in the water column. Plants do get their nutrients and minerals through the root system (hair roots). The substrate of planted tanks should contain 2 layers. First a nutrient rich substrate as a lower layer. To prevent a possible washout of nutrients and as an anchoring device for the plants, regular gravel or sand should be used as a top layer. The lower level should be as high as the plant roots, generally 1-2 inches. The top layer should be about 2 inches in height. Sea sand is not recommended for use in aquariums because of impurities. Sea sand holds many living organisms which can die off and pollute the water. Small sea shells and coral pieces will raise the pH, it can also compact itself rather densely, which is not necessarily beneficial for bottom dwellers, crabs and other sand loving fish and species. Painted gravel or glass pebbles should not be the first choice. Glass pebbles can diffuse the light, which can irritate the fish. Painted gravel can loose its outer coating. Risk to your fish can be avoided from the start. Probably the most used substrate for aquariums. The gravel comes in fine or more coarse varieties and consists almost entirely of quartz. It is safe to use and does not influence the water parameters at all. This gravel is suited for fish only aquariums and as top layer for planted aquariums. Regular maintenance by vacuuming the gravel is a must in order to remove uneaten food particles. In combination with a good filtration system, sand can be the cleanest substrate of all. Sand will compact itself and food particles can not penetrate the surface. A strong filtration system will simply remove the particles from the surface. In many cases, the filter intake tube will have to be adjusted in order to avoid the sand being pulled inside the filter. With good filtration in place, the sand does not have to be cleaned as frequently as compared to common aquarium gravel. Sand as a substrate will also provide a more natural habitat for many species and bottom dwellers. Two rather cheap sources of sand are sandblasting sand, which is more coarse than regular sand and mostly consist of quartz, and play sand, which has a finer consistency. Play sand is sterilized for the good of our children, and therefore suitable for the fish as well. Aragonite is a calcium carbonate mineral. Aragonite sand holds a lasting reservoir of calcium carbonate, which is slowly but constantly released to buffer and to hold up the pH. Using aragonite can push the pH to about 8.2 The released calcium is a valued trace element for corals and overall functionality of the aquarium. Aragonite sand can be mixed with live sand or crushed corals. Due to the pH raising character it is suited for marine and reef set-ups only. Most commercially available crushed corals are mixed with aragonite or similar calcareous materials such as dolomite and calcite which are similar to aragonite. Crushed corals and the mixtures thereof are suited for marine, reef aquariums, brackish water and African chiclids in freshwater. Vermiculate is a mineral mixture of aluminium, iron and magnesium. After the mining process, vermiculite is heated to eliminate water pockets. The result is an increase in volume of 15 – 20 times it original size. The heating process where temperatures reach up to 1000 C (1800 F) makes vermiculite sterile with a high water holding capacity, high surface, and a neutral PH. Vermiculite has a high caution exchange rate, which is how plants utilize the available nutrients and minerals. Vermiculate also slowly releases valuable nutrients such as potassium and magnesium over a long period of time. This substrate type is ideal as a lower layer for planted aquariums. Since it has a tendency to compact itself over time, it should be mixed with laterite or common aquarium gravel to maintain the porous structure.